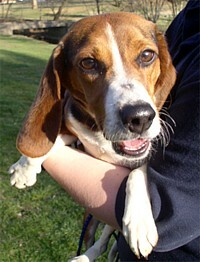 I received an email referral from Safe Hounds Beagle Rescue in NJ. They had received an email from a volunteer at a shelter in central PA about a very sweet female Beagle who had come in as a stray and had something wrong with her back legs. I contacted Laura, the volunteer, to find out more, and was told all about Miley. This sweet young Beagle girl had a beautiful face and a great temperament.... but as she walked, her legs would slide out from under her. Because of my own experience as an owner of a dog who had suffered a back injury and gone through rehab and recovery, I immediately suspected a back problem and wanted to know more. The volunteer supplied videos which clearly showed Miley's walking difficulties. The shelter had taken X-rays which showed no evidence of fracture in her hips or back, but didn't have the funds to do more for her. Because of her health concerns, she was designated as unadoptable to private individuals, and rescue help was sought. Miley would require the help of a rescue with the right combination of resources at their disposal: a foster home experienced with caring for special needs dogs, the funds or ability to raise necessary funds to cover the cost of medical care which might include surgery, a nearby neurological specialty vet, and a nearby veterinary rehab facility. Over the course of a week, I contacted several east coast rescues who are known for taking in special needs cases. However, the timing wasn't right- none had available space. When I contacted Cascade Beagle Rescue-West, luck was on Miley's side. They had recently adopted out another special needs dog, and they had prior experience with other dogs who had suffered back injuries. The door of opportunity just swung open for Miss Miley. The next step was to make arrangements to get Miley from Philadelphia, PA to Portland, OR. Fortunately, Cascade has an east-coast chapter with several volunteers in southeastern PA. On Wednesday evening, April 23, Cascade Beagle Rescue-East volunteer Cheryl picked up Miley from the shelter and fostered her until her early plane flight Friday morning. Bright and early, at 5:15 am, Miley boarded a plane in Philadelphia and flew the first part of her journey into O'Hare Airport in Chicago. After a bit of a layover, she flew the final leg from O'Hare and arrived in Portland, OR in time for supper. And now the work begins. Miley went to the neuro vet for evaluation. An MRI revealed that her injuries had most likely been sustained from being hit by a car. She is now in her second week of physical therapy. It also turns out that she is actually younger than originally thought (closer to 10 months!) and full of life and love.... and puppy energy! So, the weeks ahead will tell the story of what the future holds health-wise for this lucky girl. Please join BotW in thanking and congratulating all of the people who cooperated in this rescue effort- the shelter and the rescues. It's a wonderful story of how joining forces helps the cause of rescue. To follow Miley's progress, go to Cascade Beagle Rescue - West.